Rupert Keegan came from a wealthy background - his father was an airline pioneer - and he enjoyed a swift rise into the Formula One ranks. His first race was in 1973, and the following year his father bought the Hawke racing company amid rumours he would fund the construction of a BAF-Cosworth car. Although that never happened Keegan remained with March, winning the Formula Three title in 1976. After a brief dalliance with Formula Two in 1977, he joined the Hesketh team in that summer but despite some good displays in practice, the car was not competitive and he struggled. 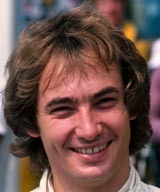 He switched to Surtees in 1978 but that was a case of out of the frying pan into the fire with another substandard car. In 1979 he decided to switch to the Aurora AFX British Formula One Championship in an Arrows A1, he won the title the following year. That triggered a return to F1 with RAM Racing Williams but once again he found himself landed with an uncompetitive car. A final attempt at F1 came in 1982 when he was called in as cover for the injured Jochen Mass, but he again failed to shine. In 1983 he teamed up with former Hesketh team-mate Guy Edwards to race a Porsche 956 and finished fifth at Le Mans. After three seasons Keegan decided to go to America and try his hand at CART. He took part in a handful of races with the Machinists Union team and then faded from the international scene. In 2002 he emerged as the driving force behind a move to stage a run-off between F1, CART and NASCAR cars in Dubai but the venture fizzled out.